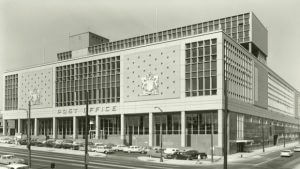 Exciting redevelopment plans for the biggest vacant building in downtown Vancouver — the old post office — have been unveiled. 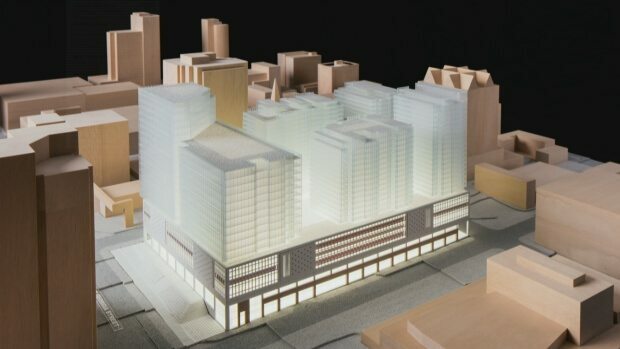 The project is still years away, and a rezoning application is not expected to be submitted until later this year, but the developer, Bentall Kennedy, plans to convert the massive old building into a mix of retail, offices and residential with four new towers built on top. 300,000 sq ft of retail space, including space for large format retailers. Large retailers looking for space in downtown Vancouver include Simons, Saks Fifth Avenue, Uniqlo and Whole Foods. 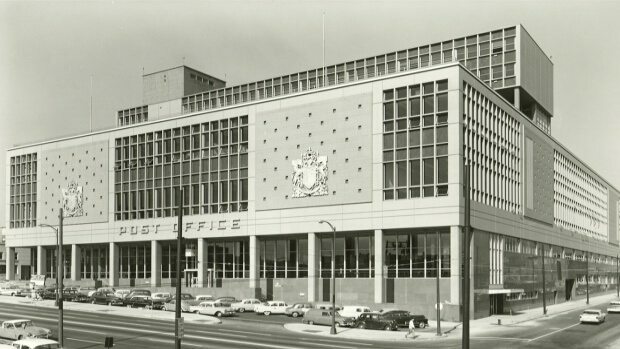 Historic photo of the Canada Post building in downtown Vancouver, widely considered to be an excellent example of the International Style of architecture popular in the 1950s and 1960s. The redevelopment doesn’t have a name yet, but if approved, is expected to be completed by 2021. The area around the post office is undergoing huge changes with the recent opening of the Telus Garden office and condo development, as well as the Vancouver Art Gallery’s plan to move to a new building a block away at Cambie and West Georgia St. The project will be the largest heritage revitalization in the city’s history and will continue downtown Vancouver’s expansion eastward.